We are excited to introduce another product to our Dunn's Fish Farm Line. 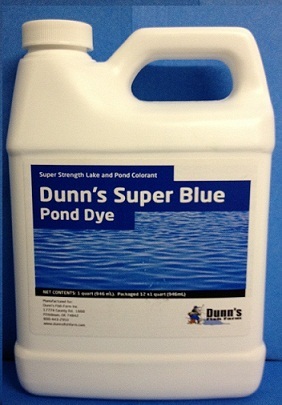 Dunn's Super Blue Pond Dye is specially formulated to give a very natural blue look at a very competitive price. The technology used in our dye delivers a concentrated blue colorant, using only a 1/4 of other popular commercial dyes on the market today. 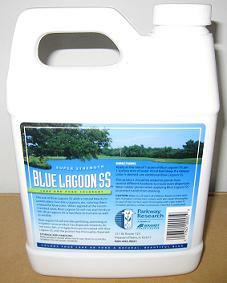 This product is sold by the quart giving our customers the convenience of smaller backyard application and making it affordable to treat larger bodies of water. An average application can be 1 quart of product treating 1 acre 4 foot deep. Dunn's Super Blue Pond Dye is 4 times stronger than competitve products and we are delivering it at the most competitive price possible. Apply at the rate of 1 quart per each surface acre of water 4 feet deep. Additional amounts may be added if deeper color is required. * This product can ship to all states. A deep aquamarine color, Blue Shadow S.S. colors lakes, ponds and fountains in the same manner and rates as Blue Lagoon SS, but imparts a pleasant shade reminiscent of the deep waters of the Caribbean. Black in color, Loch Ness S.S. was originally designed for shallow, muddy ponds and lakes to visually block out all the unpleasant appearance that these waterways presented. 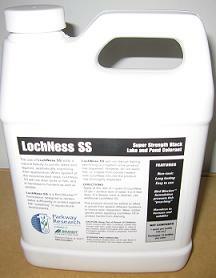 While created for that purpose, Loch Ness S.S. is aesthetically pleasing and used in many aquatic applications for a rich deep, dark and clean appearance. 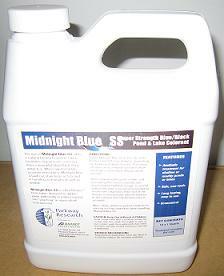 Midnight Blue SS adds a natural beauty to ponds, lakes, fountains and lagoons coloring them with a unique blue/black deep water hue. WHAT IS AQUASHADE? Aquashade is a blend of blue and yellow dyes specifically designed to screen or shade portions of the sunlight spectrum (red-orange and blue-violet) required by underwater aquatic plant and algae growth. 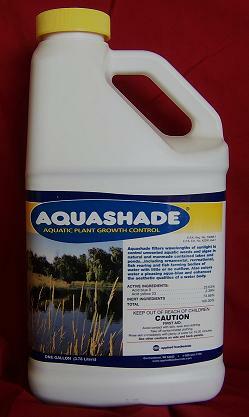 Aquashade is available in individual one gallon bottles or by the case. Each case contains four one gallon bottles. *You should check your Local and State laws before using this or any other product. *New York residents must obtain permit before purchasing any EPA registered Product. 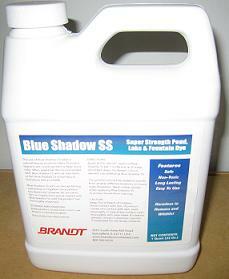 WHAT IS Lake Colorant? LAKE COLORANT is a blended formulation of water soluble dyes designed for use in smaller lakes, ponds, decorative water features and other impounded bodies of water with limited outflow. Lake Colorant beautifies murky, cloudy or off-colored water with a natural aqua-blue tint. One concentrated packet treats 326,000 gallons of water (one acre-foot). Home | About | Pond Size Calculator | Fish Types | Stocking Rates | Fish Pricing | Fish Delivery | Supplies | Electrofishing | Got Algae?